New Year... Time for Prosperity and Black-Eyed Peas! In many parts of the world and primarily in the Southern states of the USA, it's a tradition to eat black-eyed peas on January 1st for good luck and prosperity in the new year. I was all set to post two yummy recipes yesterday but was busy with other things and never got to it! Gah! No worries... just one day late. Some people can call this Hoppin' John... I just think of it as a delicious ham and bean dish. In a large Dutch oven or kettle, combine the black-eyed peas, ham bone or ham hocks, and 6 cups water. Cut 1 of the onions in half and add it to the pot along with the garlic and bay leaf. Bring to a boil, reduce the heat to medium-low, and simmer gently until the beans are tender but not mushy, 2 to 2 1/2 hours. Remove the ham bone or hocks, cut off the meat; dice and set aside. Drain the peas and set aside. Remove and discard the bay leaf, onion pieces, and garlic. The holidays are a time for digging out traditional family recipes and rediscovering recipes that you forgot you loved. This cookie is one that is quite old, but fell from favor I think, because it's a couple more steps of labor involved. You have to make dough, cut them out, prick them with a fork, bake and then make a frosting filling to sandwich them together. Well worth the effort but many people stopped making cookies from 'scratch' so perhaps this seems as if it's not worth it. Mix and chill dough 1 hour. Preheat oven to 375. Roll the dough 1/8" thick. Cut into 1 1/2" rounds. Transfer to wax paper with sugar and coat both sides. Place on a parchment lined cookie sheet and prick with a fork. Bake 7-8 minutes. Let cool completely. tint to the colors you wish. Baby it's cold outside! At least it is where I live and a nice hot bowl of Texas White Chili was perfect. For those that have never had a 'white' chili - think of this more as a white Mexican style soup. Top it with grated cheese served on the side. Simmer 1 hour. Add 8 oz. Jack cheese, shredded, simmer 15 minutes. Serve with extra cheese on the side for those that wish. *smash about a third of the beans with the back of a spoon while in the soup pot if you wish to make the broth thicker and more opaque. My regular readers know that Saturday night is "Pizza Night" in our household. With Christmas being celebrated this Saturday we won't be having our traditional weekly fare, but I've been craving the Greek Feta Pizza I make so yesterday while I was running errands I made sure to pick up some fresh baby spinach leaves so I could make this tonight. I've featured this one before, but it's one of my favorites and you can change the flavor by using what you have on hand, substituting and adding a few other ingredients if you wish. Keep the basic recipe but make it your own. We love the white cheese layer so much I usually double that portion of the recipe so we have a nice thick layer of tangy feta and garlic to my homemade thick crust pizza. I'm going to post the original recipe although I make my own homemade crust, I don't use the sun dried tomatoes at all (I don't like their chewy texture) and I use black olives instead of Kalamata olives because I always have black olives on hand. Preheat oven to 450. Mix mayonnaise, garlic and 1/2 c feta in bowl. Place pizza crust on cookie sheet and spread the mayonnaise mixture over. Top with tomatoes, olives and oregano. Bake 10 minutes. Toss spinach and onion with 1 T tomato oil. Top the hot pizza with this mixture and the remaining feta. Return to oven, bake 2-3 minutes longer. Cut and serve. This recipe has been sitting in my files for a while and I'm not sure where I found it but I'm glad I saved a picture. It's the picture that catches your eye and say "this is just right for an extended family Christmas dinner". Looking at it I just think 'death by chocolate' but I know it's the exact kind of 'cake' my husband, son and oldest daughter love. Absolutely love. Do you need a pretty and elegant yet delicious chocolate dessert for this holiday weekend? Preheat oven to 350 degrees. Butter an 8-inch-round cake pan; line bottom with a round of waxed or parchment paper. Butter paper; dust bottom and sides of pan with cocoa, tapping out excess. Sift together cocoa, flour, baking powder, and salt. With an electric mixer on medium-high speed, cream butter and 1 cup sugar until light and fluffy. Add eggs one at a time, beating well after each and scraping down sides of bowl as needed. Beat in vanilla. Reduce speed to low. Add flour mixture in two batches, alternating with the sour cream and beginning and ending with the flour. Spread batter in prepared pan. Tap pan firmly on countertop once to eliminate large air bubbles. Bake until a cake tester inserted into the center comes out clean, 30 to 35 minutes. Cool 10 minutes in pan, then invert onto a wire rack to cool completely (bottom-side up). Set rack with cake over a rimmed baking sheet. Pour glaze over cake, letting it run over sides; spread gently with an offset spatula or table knife to coat. Let set, about 30 minutes. If desired, whip cream and remaining 2 tablespoons sugar with an electric mixer until soft peaks form. 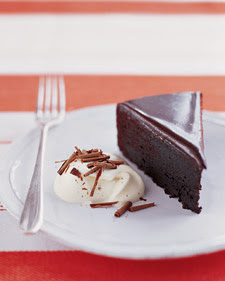 Serve cake with whipped cream and chocolate shavings. Those of you in America might remember a television commercial for a bathroom cleaner that uses (used? 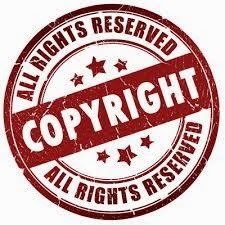 I don't know if they are still using it as I quit watching television back in September of 1998) the phrase; "We work hard so you don't have to!" 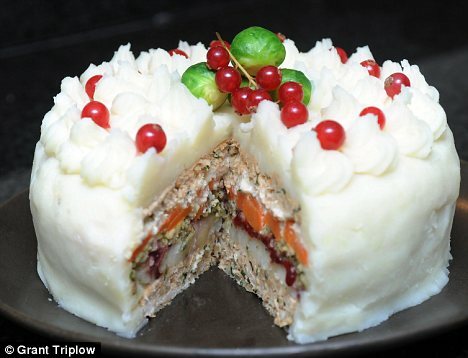 That's what came to mind this morning as I was sipping my coffee and reading the news and stumbled upon a yummy but odd recipe; Christmas Dinner Cake (or Thanksgiving Dinner cake as chow.com called it - or even Turkey Cake, as I think of it). After the Chow website featured it for our American Thanksgiving holiday, a man in Europe made his own version (which is how I stumbled upon it). You have to admit; it's eye catching and quite pretty! But if you are hoping for sweet cake, frosting and cherries you would be sadly disappointed. However, if you are like me and don't care for sweets as much as you do stuffing and vegetables, this might be the kind of cake you can dig into! Would I ever make this? I think perhaps I might... for fun. And since my family trusts my cooking I know they would try it -and probably like it! But for now I'm tucking it into my 'collected' recipes online. As far as I'm concerned (for now) HE worked hard... so I don't have to! Heat the oven to 175c. Coat two 8-inch cake pans with butter. Place all the turkey layer ingredients in a bowl and mix well. Divide the mixture evenly between the pans. Bake until cooked through and the cakes begin to pull away from the edges of the pans. Make your mashed potato and boil and mash your parsnips. Mix the two. Remove turkey from oven but leave the oven on. Let turkey cool for 10 minutes. 1. Remove one of the layers from its case and place it bottom-side up on an overturned cake pan or in an oven-proof serving dish. 2. Evenly spread a 1cm layer of your potato and parsnip mash on top of the turkey layer, leaving a 1cm border. 3. Spread a generous layer of ­cranberry sauce. 4. Make up the stuffing and spread a layer 1cm thick. 5. Carefully place a layer of carrot pieces. 6. Add a 1cm layer of bread sauce, again remembering to leave a space at the edge so that it does not spill out when the final meat layer is added. 7. 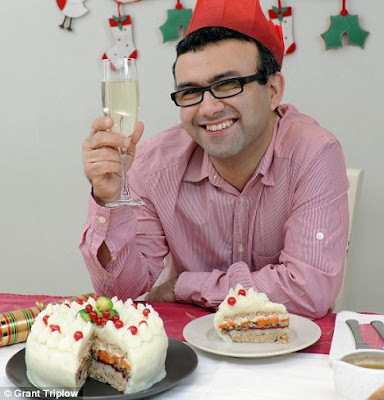 Now take the second turkey layer out of its cake mould and place it ­bottom-side up on top of the bread sauce. 8. Transfer the cake pan with the ­partially assembled cake to a baking sheet and bake for a further 20 minutes. 9. Remove from the oven and set aside. With a long knife or spatula, evenly coat the outside and top with mashed potato. Serve with warm, meaty gravy... and tuck in. One of our Annual Traditions at Christmas... Rosettes! You must have a rosette/timbale set to make these. I took a personal day off from work last week to immerse myself in Christmas music, baking and wrapping... finding Christmas when it seemed to be non-existent in my too-busy world. I have cut my baking list down from what it was 10 years ago when I was a full time housewife, but I still managed to make 13 items this year and the variety trays were made in time for the high school bake sale as well as extra trays for my husbands employees and to use for our extended family holidays. Christmas is about traditions. Just when you might think it isn't, and skipping something or other doesn't matter, you have a sight, a smell or memory from your own childhood and you are instantly four-years-old again and staring at the twinkling lights on the tree. Or your teenager asks if you have made a certain cookie or candy this year and if you say you thought perhaps you'd skip them this year, the look of shock and sadness on their face reminds you that the traditions a family makes are the glue of memories. We have many (many!) traditions. This is one that goes back to my own childhood of visiting my Grandmother's house on Christmas Eve. Although my own Mom never made these delicious and not-too-sweet Rosettes, my Grandmother always (always!) did and I grew up loving them. They are a tradition in our home and I hope one day to share the tradition with my own grandchildren as well. Break eggs into a bowl, add sugar, salt, vanilla, milk and flour. Beat briefly just until smooth. Do not overbeat! Too much beating makes your rosettes blistered and tough. Have hot oil, lard or shortening in a pan on the stove heating. Leave the rosette iron in the hot oil for several minutes while you make the batter. Dip the hot iron into the batter being careful not to let the batter come up over the edge of the iron. Dip just about 4/5th of the way up the iron. Immediately place the iron/batter into the hot oil. Hold the iron in place and cook the rosette until it's golden brown and crisp. The temperature of the oil is perfect when it takes about 25-30 seconds for the rosette to cook. Too fast and it burns, too cool and it will be soggy and greasy. Use a fork to shake the rosette off the iron and onto a paper towel lined rack. When they are cool sprinkle with powdered sugar. These can be frozen. This recipe will make about 40. If they do not come off the iron they were not fried long enough or you let the batter come up over the edge of the iron. If they are blistered and thick, you have beaten the eggs too much. If the rosettes drop off in the hot oil the iron is not deep enough in the oil. If they are not crisp they have been fried too fast or the oil was not hot enough. You must have a rosette set to make these. Don't dip the batter up over the edge of the iron so they will slide off after frying. Sprinkle with powdered sugar for a delicious treat! In addition to the holiday baking I had to make a dessert for my husband to take to work today for an employee pot luck. He always signs us up for a dessert and I know this crew; they love chocolate. Last night as I stood in the kitchen, not in the mood to bake, but knowing I had to have something ready by 8:am, I decided to cheat and use a brownie mix. But... plain brownies are boring. Instead? A flip through an old holiday cookbook from about 12 years ago gave me an idea; Cappuccino Brownies. A triple layer dessert I could top with a little chocolate covered espresso bean. If you have a favorite brownie recipe, by all means use it - but if you want to cheat and use a mix, don't feel guilty. It made this recipe even quicker to whip up last night before bed. While the brownies bake, dissolve the coffee crystals in the whipping cream. Beat together the powdered sugar and 2 T butter in a mixing bowl with an electric mixer. Add whipping cream and coffee crystal mix. Beat creamy and add a bit more whipping cream if it's too stiff. Spread over warm (but not hot) brownies. Chill at least an hour until set. Melt the unsweetened chocolate completely and add the butter, powdered sugar, milk and vanilla. Spread over the cappuccino layer. Chill until frosting is set. Cut into bars. I topped ours with a chocolate covered espresso bean on each square. Got any holiday parties this week or next? A perfect dip that goes quickly is a simple Spinach Artichoke Dip. I've posted a few versions of this over the years but this is the version I use myself most often. Remember though; play with your food! By that I mean - add what you like, leave out what you don't. Out of a specific ingredient? Using common sense of course, just substitute something else. (Like more sour cream and less mayonnaise, more mozzarella instead of Parmesan, etc.) I don't want you to have to run out to the store for something as simple as mozzarella cheese if you already have plenty of Parmesan on hand. This is that kind of recipe; it's forgiving to some extent. Combine 1 1/2 cups mozzarella, sour cream, 1/2 the Parmesan, the garlic, artichokes, cream cheese and spinach in a large bowl; stir until well blended. Spoon mixture into a greased/sprayed 1 1/2-quart baking dish. Sprinkle with remaining 1/2 cup mozzarella and remaining Parmesan. Bake at 350° for 30 minutes or until bubbly and golden brown. Serve with tortilla or pita chips. Peppermint Pinwheel Cookies. You've seen them on my site previously and I've made them for a number of years since the 90's but I've never 'loved' my recipe. It's just a recipe that worked, looked pretty and was fine. People seem to love them and they are always some of the first to go on a large variety platter. But I'm always on the look out for better recipes or 'improving' a cookie I already make. And I think this is it. It's double the fun because it uses two swirl cookies sandwiched together with peppermint frosting. I would not individually wrap them as my cookies go on a platter but starting with this idea from Southern Living (2008) I would make them just a bit thinner so they lay flat and aren't too thick with the filling, and then make them similar to Cream Wafer cookies. Beat butter at medium speed with a heavy-duty electric stand mixer until creamy; gradually add sugar, beating until light and fluffy. Add egg and vanilla, beating until blended, scraping bowl as needed. Combine flour, baking soda, and salt; gradually add flour mixture to butter mixture, beating at low speed until blended. Divide dough into 2 equal portions. Roll 1 portion of dough into a 12- x 8-inch rectangle on a piece of lightly floured plastic wrap. Knead food coloring paste into remaining portion of dough while wearing rubber gloves. Roll tinted dough into a rectangle as directed in Step 3. Invert untinted dough onto tinted dough; peel off plastic wrap. Cut dough in half lengthwise, forming 2 (12- x 4-inch) rectangles. Roll up each rectangle, jelly-roll fashion, starting at 1 long side, using bottom piece of plastic wrap as a guide. Wrap in plastic wrap, and freeze 4 hours or up to 1 month. Preheat oven to 350°. Cut ends off each dough log, and discard. Cut dough into 1/4-inch-thick pieces, and place on parchment paper-lined baking sheets. Bake at 350° for 6 to 7 minutes or until puffed and set; cool cookies on baking sheets 5 minutes. Remove to wire racks, and cool completely (about 30 minutes). 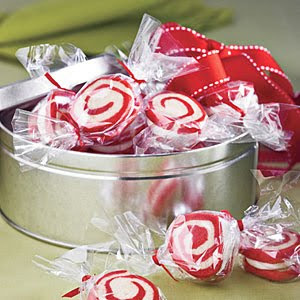 Place Peppermint Frosting in a heavy-duty zip-top plastic freezer bag. Snip 1 corner of bag to make a small hole. Pipe about 2 tsp. frosting onto half of cookies; top with remaining cookies, gently pressing to form a sandwich. These cookies are delicious eaten at room temperature, or chill them 30 minutes for a firm, cool filling. Last week I was buying groceries and although I picked up a couple of baking items, I didn't have it in my budget to purchase many so when I saw almond paste, I left it there and continued on my way. Of course today Super Walmart was completely sold out of almond paste, the dollar store didn't have any, and our local grocery is closed on Sundays. I have a bag of almonds in the cupboard and can just as well make my own. Now although there are some recipes that call for just powdered sugar and ground almonds, the end is not going to be like the almond paste you want. You need a sugar syrup base. This recipe is odd. Sometimes (depending on the weather?) I need to add just about 1/4 c more ground almonds to the mix. Other times it's a bit dry and I add just a teaspoon or two more corn syrup. I also found that I like to add just a touch of vanilla flavoring to the mix - I use real vanilla for this one but if you only have extract that's cool. Make a sugar syrup by placing the water, granulated sugar and corn syrup in a saucepan. Stir it to combine. Bring it to a boil for 3-4 minutes and let it cool. Place the almonds in a food processor and process them fine. Add the powdered sugar. With the food processor running, slowly add the sugar syrup until the mixture forms a paste. Store the almond paste tightly covered. Let it set 24 hours before using if you can so the flavors mix. If you will be storing it for more than a week, store in the refrigerator. My oldest daughter has spent the last 5 years watching me take photos of our food and keep track of recipes for my website. I guess it's only natural she took a cue from me and started to take photos of meals on her travels. She went to London when she was 16 and was determined to avoid all the fast food and 'typical' tourist stops in order to try real English foods. She returned home with photos of her meals and descriptions of what it was, what it tasted like and the pub or restaurant she ate it in. This has continued through her other travels and last summer when she returned home from a Mission Trip she was raving about the empanadas she enjoyed. Made with fillings such as beef and olives, ham, spinach and cheese or chicken, I gathered many different versions at the time to add to my files. This one sounded good to me because it used chicken and green olives... I love green olives! It's not like the ones she had on her trip, but the saltiness of olives always gets my attention. Sift the flour, salt and baking powder into a large bowl. Stir in the butter and 1 of the eggs, then gradually stir in about 3-4 oz. warm water to make a soft dough. Wrap in plastic wrap and chill for 30 minutes. To make the filling, heat the oil in a frying pan and add the onion. Cook for 3-5 minutes, until softened, then add the garlic and cook for a further minute. Add the red pepper and cook for 2-3 minutes until softened. Stir in the tomato pure, paprika and cumin and mix well. Add the chicken and olives and season with salt and pepper. Simmer for 2-3 minutes, adding a splash of water if the mix gets too dry. Set aside to cool. Preheat the oven to 400 degrees F. Roll out the pastry to a thickness of 1/8 inch and cut out circles approximately 5 inches in diameter. Divide the filling between the pastry circles and moisten the edges with water. Fold the pastry over to enclose the filling and crimp the edges to seal. Transfer to a baking sheet and brush with milk to glaze. Bake for 10-15 minutes, until risen and golden. These are a classic from almost every recipe book, site and bake sale. They happen to be one of my most favorite bars and amazingly enough, I didn't know they existed until I was about 18 years old! My Mom did a little bit of baking as I was growing up but she didn't have a large repertoire and she didn't like lemon so she never made these. When it came to bars of my childhood we had two; brownies and once in a great while after I was a teenager, blondies (chocolate chip cookies made into bars basically). I tasted 'new' foods at the 'punch and cookie' receptions at my elementary school after our music concerts and plays and at church pot lucks. I had these bars when I was 18 years old. I fell in love instantly and made them off and on over the years ever since. Personally I like the crust so I used to pat this in a smaller pan so the crust would be thicker, as well as the bar. The 9X13 is standard and makes a nice standard bar. Mix butter, powedered sugar, 1 1/2 c flour, and half of the lemon zest together until crumbly. Press into a baking pan (9X13) pan. Bake for 20 minutes at 350. While the crust is baking; Mix lemon juice and the rest of the reserved lemon zest with 3 beaten eggs, granulated sugar, and 3 T flour. Pour over hot crust. Put back in the oven and bake another 20 minutes at 350. Remove from oven, let cool and sprinkle more powdered sugar on top for dusting. Snowballs, Russian Tea Cakes or Mexican Wedding Cakes... many names! Last weekend I started my holiday baking by getting 6 goodies done and into the freezer. One of them was my favorite... Russian Tea Cakes! Also known as Mexican Wedding Cakes or Snowballs, they are a buttery, melt-in-your mouth, not too sweet cookie that is baked to still be white, rolled in powdered sugar while still warm and then rolled a second time to give it its trademark 'snowball' look. A holiday favorite for years - and yet another recipe that I play with. Yes... remember I always tell you to play with your food! Have fun with this one by changing the nuts you use and the flavoring you add. Preheat oven to 400. Mix butter, powdered sugar and vanilla in a large mixing bowl. Stir in flour, nuts and salt. Shape into 1 inch balls. Bake 1 inch apart on ungreased baking sheet for about 10-12 minutes. They should not brown. Remove from cookie sheet. Cool slightly and then roll in powdered sugar and let cool. Roll a second time. Can freeze for later use. This is a recipe I've had in my files for years but don't make. It's not because of the richness of it - I think it would make a terrific morning bread any day and I'm never one to turn down anything with bacon and onions in it! But... perhaps it's a 'time' issue. I just don't have the time to make things in the morning.... not even on the weekends! Some of you may have a modern version of this one made with crescent rolls... but this is a more traditional version. Traditionally baked in earthenware molds, you may use nonstick aluminum or glass - it's all good! In a medium skillet, cook the bacon over moderate heat, stirring, until lightly browned, about 7 minutes. Using a slotted spoon, transfer the bacon to paper towels. Add the onion to the skillet and cook, stirring, until softened but not browned, about 5 minutes; using a slotted spoon, transfer to paper towels. In a standing mixer fitted with a paddle, combine the milk, sugar and yeast and let stand for 5 minutes. Add the egg and salt and beat at medium speed until blended. Gradually add the flour and continue beating until the dough is elastic, about 4 minutes. Gradually add the 11 tablespoons of softened butter, beating until the dough comes cleanly off the side of the bowl, about 8 minutes. At low speed, beat in the bacon, onion and walnuts until evenly distributed throughout the dough. Cover the bowl with plastic wrap and let the dough rise at warm room temperature until doubled in bulk, 2 to 3 hours. Generously butter a 9-inch kugelhopf mold or fluted tube pan and sprinkle the almonds in the indentations in the bottom. Punch down the dough, shape it into a ball and make a hole in the middle. Set the ring of dough in the mold, cover and let rise until the dough almost reaches the top of the mold, about 1 hour. Preheat the oven to 375°. Bake the kugelhopf for about 40 minutes, or until golden brown. Transfer to a rack and let stand for 10 minutes, then unmold. Brush with the melted butter while still warm and serve at room temperature. Christmas baking 2010 has begun! I have 6 goodies made and into the freezer. Although I'm cutting back this year and not doing nearly as many different recipes as I usually do due to my hectic schedule, I still have about 8 more items I'd like to make. If you are a regular around here you know that one of the 'must have' items on the list is M&M Pretzels where you melt a Hershey's Kiss in the center of a round pretzel and top it with an M&M. Yummy for those that like chocolate (most of the world!) but alas, if you are a regular reader you also remember that I don't care for chocolate. What I do like? Peppermint Pretzels! I though I had a 'finished product' to show, I looked over the photos on my camera and it seems with all the baking I did today I didn't snap a picture of the finished Peppermint Pretzels. They are already in a ZipLoc baggy in the freezer so you'll have to just imagine! While I like to top these with a little peppermint swirl "chocolate chip" - I did not have any on hand so today I melted them in the oven, tapped the tray on the counter to 'settle' the melted mint into the rounds of the pretzel and then left them to harden that way. Place round pretzels on a parchment or foil lined baking sheet. Place an unwrapped peppermint kiss in the center of each. Place into a warm oven (325 is fine) for a few minutes until the mint is shiny and soft. Remove and gently press one peppermint chip or even a red or green M&M into the center of each to squish it down into the round form. Let set until they harden. These can be frozen as well! Prior to Thanksgiving this year I found a couple 'new to me' recipes I debated trying. I thought this one sounded good at the time (and still do!) so I added it to my files for a 'possible' side dish. Alas, I was craving our traditional Green Bean Casserole and although I would have gladly made both versions, I was so busy with overtime at the office that I did not have fresh green beans nor Gorgonzola cheese on hand so it was not made. However, it still looks delicious and I still hope to make it for a weekday meal in our household. 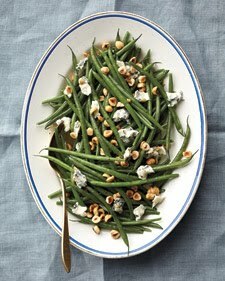 For the collection; Green Beans with Gorgonzola Cheese. 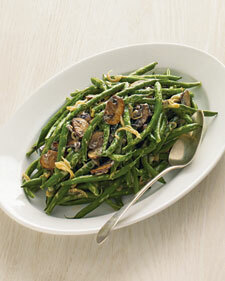 Steam green beans until crisp-tender, 4 to 8 minutes. Transfer to a bowl and toss with oil and vinegar; season with salt and pepper. Sprinkle with Gorgonzola and nuts. I'm signed up with My Recipes to get their cookie of the day through the month of December and when I saw this one yesterday I wanted to take the time to click on it and read though it... but I haven't had time yet!!! 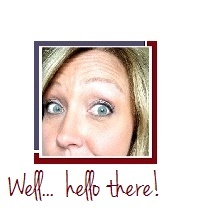 I hate my email box cluttered - so I wanted to add it to my collection to look at later. Hopefully this weekend!?? Chocolate, lemon, spice, or sugar; add just a touch of a special ingredient to the foolproof cookie base and create a variety of Christmas cookies. Cream butter and 1 2/3 cups sugar in bowl of an electric mixer and beat until fluffy, about 5 minutes. Add vanilla, baking powder and salt and beat at medium speed until mixed. Add eggs; beat until blended. Add flour and mix at low speed until combined, scraping down bowl once or twice. For Spice Cookies: Beat 2 Tbsp. sugar, ginger, cinnamon and allspice into full batch of Sugar Cookie dough. For Lemon Cookies: Beat lemon zest into full batch of Sugar Cookie dough. 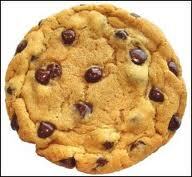 For Chocolate Cookies: Follow Step 1, but add cocoa powder after beating in eggs and then add only 2 2/3 cups flour. Divide dough in half. Using hands, shape dough into discs, wrap tightly in plastic wrap and chill until firm, at least 1 hour and up to 2 days. Arrange racks in upper and lower thirds of oven and preheat oven to 350°F. Line 2 large cookie sheets with parchment. Remove 1 disc of dough from refrigerator. Roll out on a lightly floured surface to 1/4-inch to 1/8-inch thickness. 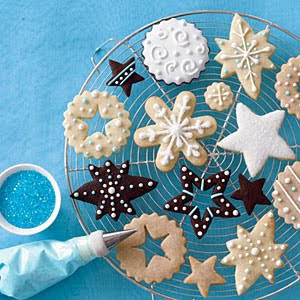 Cut cookies into stars, snowflakes or any other shapes. Transfer cookies, with a metal spatula, to baking sheets and chill for 10 minutes. Bake cookies 12 to 15 minutes, depending upon thickness and size, rotating pans halfway through, until golden and firm to touch. Cool for 5 minutes, transfer with a metal spatula to racks and let cool. Repeat with remaining dough. To decorate cookies with solid icing, put some Royal Icing in a pastry bag with a small plain, round tip. (Or put icing in a sturdy plastic bag and snip a tiny hole in one corner.) Pipe around edge of each cookie and let dry. Stir 1 Tbsp. water into another portion of Royal Icing to soften; put thinned icing in a clean pastry bag or new plastic bag. Pipe icing onto each cookie, flooding inside of border. Let dry. Re-pipe border. Sprinkle cookie with sanding sugar, shake off excess and let dry. Work at the office is crazy this week... not to mention the home schedule! Give me a couple days to catch up! I dearly love jalapeno poppers, but I like the breaded kind stuffed with cream cheese. The stuffed and breaded style are a pain to make and also quite messy so admittedly I'd rather purchase them in the frozen food sections than make those by hand. I also love bacon - so these unbreaded jalapeno poppers are a yummy appetizer when I want to make something quick and easy that is almost-but-not-quite as awesome as the time-intensive breaded version! Ha. Make sure jalapenos are halved and seeded. May need to wear rubber gloves when doing this to prevent the oil soaking into your fingertips and burning your eyes or lips when you accidentally touch them later! Stuff each half with cream cheese and wrap with a half piece of bacon. Cook in pre-heated oven at 350 degrees until bacon in done. I like to broil them under the broiler for about 3 minutes to crisp the bacon. You can adjust this recipe to make as many or as little as you need. I think it may be a Midwestern thing... coupled with an older generation thing. Homemade Apple Butter. There really is only one person I personally know who makes it anymore... and that is my 82 year old father-in-law. The thick, brown, sweet spread may taste good, but I'm not a fan of fruity spreads in general, I don't eat breakfast so I never will use it smeared on toast, and even though I've offered and even made peanut butter sandwiches out of it in the past, my kids don't care for it either. I think because it is a dark, gritty brown spread when a nice brilliant red berry or grape jam is more appetizing looking. But wait! I have an answer!! While looking through some old fashioned recipes from the heartland of America I spied a pumpkin pie that uses apple butter! A PERFECT blend of flavors and tastes, the apple makes it oh-so moist... I knew it was a great marriage of flavors baked in a pie. Just in time for Thanksgiving... I can make our traditional pumpkin pie AND use up the gift of delicious apple butter we were given! Combine tart apple butter, pumpkin, sugar, salt and spices. Add egg. Mix well, add milk gradually. Mix well. Pour into pie shell and bake in hot oven at 250° about 40 minutes. With my busy schedule, working right up to Thanksgiving Day, I wanted to do a few things ahead of time if I could. One of those was the Pumpkin Cheesecake I made (and posted) yesterday. Today I finished our traditional Thanksgiving Cupcakes. If you've been checking into the American Housewife site in November of the past 5 years you may have already caught a photo or two of previous cupcakes. Here is a quick link to the 2006 , (2004 photo included) - and my 2009 cupcakes just to show you how I make tiny differences each year based on the cookie I find or whether I use caramel or chocolate chips for the 'gravy'. You can also click on either of those links for ingredients and instructions on making your own little turkey dinners. 'plate edge' it could provide. and disappears as it cools. but it wasn't that important to me this time. Although I've made this dessert for a few years now, this is a recipe that didn't actually exist until I finally wrote it down last night. I told my oldest daughter, who was in the kitchen when I made it, that I had better write it down and put it in the holiday recipe book for her and her sister so that if anything happened to me, they would have it! Every year, I take 3 recipes, lay them out on the counter and make 'my' cheesecake by picking and choosing pieces from each. This would make it rather difficult for my daughter's to copy when they start making their own Thanksgiving dinners! As usual however, I play with my food. I make it a little different each time based on what I have. Last year the crust had some crushed gingersnap cookies and Nilla wafer crumbs added. The year before the crust had finely chopped almonds. This year I only had 4 1/2 packages of cream cheese in the house so I added 1 cup sour cream to the mixture. Play with your food. Melt butter, add to crumbs. Press into a 9" Springform pan. Bake at 400 for 5-8 minutes. Remove and lower the oven temperature to 325 degrees. Mix all smooth. Pour on crust. At this point you can wrap the pan securely in foil and place it into a large baking pan with sides that you have filled with 2 inches of water to bake. This helps it bake slowly and evenly and reduce or eliminate a crack in the cheesecake. However usually the cracks lay down flat after the cake cools and is refrigerated, and if you are adding a topping, it won't matter at all. Totally up to you. This year I did not use a water bath bake, last year I did. Bake for about 1 1/2 hours at 325 until the center is set. Cool. Refrigerate or freeze for future use. Oh what I wouldn't give to have this week off from work! With Thanksgiving this week and my 'baby' home from college and my other two kids here and all of them excited about the foods I traditionally make for Thanksgiving, they've been asking for the past week if I'm going to be sure to make 'this' or 'that' and I can only feel frustration that my job hours keep me away from the home when my heart is here. Today I made the cupcakes for the 'mini Thanksgiving Meal' cupcakes I do each year and I got the pumpkin cheesecake prepared, cooled and now in the freezer. The turkey is in the refrigerator where I hope it thaws a bit before I take it out to thaw Wednesday afternoon for good. This week I saw a recipe from Whole Foods for a green bean dish that was more healthy than the traditional green bean casserole. While my family loves the traditional version, I thought it might be a good idea to post this one here for my readers who are looking for a healthier alternative to the recipe using cream soup and fried onions on top. Bring a large pot of water to a boil. Blanch beans until tender, about 6 minutes. Drain. Heat 1 T oil in a large nonstick skillet over medium heat. Cook shallots, stirring occasionally, until tender and just starting to brown, 3 to 4 minutes. Transfer shallots to a small bowl, and wipe skillet clean with a paper towel. Whisk together stock and cornstarch. Heat remaining tablespoon oil in skillet over high heat. Cook mushrooms, stirring occasionally, until golden brown, about 6 minutes. Reduce heat to low; add shallots. Whisk in stock mixture. Cook until thick, about 3 minutes more. Remove from heat. Stir in yogurt and 1/2 teaspoon salt; season with pepper. Toss in beans. Serve warm. Is it pizza night in your house? Our pizza night is Saturday - when the kids, our friends and our kids' friends all know that 2 or 3 pizzas will be ready at 6:30 pm and everyone is welcome. I like to keep mini pizza crusts on hand - premade - so that my 14 year old daughter can fix one after school. I've found that in a pinch I've made myself an awesome 'single supper' out of these as well when everyone was on different schedules that night and I was craving pizza. A couple months ago I found this recipe - which is very similar yet different. It calls for many more onions and much more garlic than my recipe does... and has no mayonnaise to hold it together. An interesting recipe that I plan to try so I'm posting it here to add to my collection. I may have to make it tomorrow night for our Saturday Night Pizza Night! Prepare basic pizza dough. Preheat oven to 450 degrees. Saute onion and garlic in peanut oil until lightly brown. Sprinkle top of dough with virgin oil, put layer of onion and garlic on, cover with Feta cheese and ripe olives. Bake 15 to 18 minutes. Cheese should be half melted and crust light brown. It's funny that tonight while looking through my recipes for one to post I came across one I don't remember copying down in my files. I know why I chose it - my husband and son are huge deviled egg fanatics - but it's funny to me that I remember almost every recipe I've added to my collection but I don't recall this one or where it came from. Never the less it's perfect timing for a nice breakfast or brunch if you have guests visiting for the Thanksgiving holiday next week. I smile at the addition of paprika. I remember Oprah had the end of one of her shows dedicated to Deviled Eggs and she said she always thought dusting them with Paprika was a black-thang. It was after her comment that she found out that white, blacks, Latino's, Asians... we all dust our deviled eggs with paprika. She found it so silly and funny that she didn't know this, that she invited all these women to make deviled eggs and bring them to her show. They then came out from doorways and down aisles, all walking up to the stage with their homemade, paprika dusted deviled eggs. Funny, the things I remember from the days when I still watched television! In a large saucepan, cover the eggs with water, add the vinegar and bring to a rapid boil. Cover the saucepan and remove it from the heat; let stand for 15 minutes. Drain the eggs and cool them under cold running water, shaking the pan vigorously to crack the shells. Let the eggs cool in the water. Meanwhile, quarter the bread slices on the diagonal and arrange them in a single layer on a large cookie sheet. Toast the bread in a 450 degree oven for about 6 minutes, turning once, until barely browned. Shell the eggs and halve them lengthwise. Coarsely chop half of the egg whites and transfer them to a large bowl. Add the remaining whites and all of the yolks to a food processor along with the mayonnaise and mustard and process until smooth. Scrape the mixture into the bowl and blend with the chopped egg whites. Season with salt and pepper. Top the toast points with the egg spread and dust lightly with paprika. Arrange the toasts on a platter and serve. Alternatively, serve the egg spread in a bowl with the toast points alongside. Pretzels stuffed with chocolate and M&M's - Addicting! This is a fun and easy recipe that is great to make with young children. While you place round pretzels on a foil or parchment lined paper, children unwrap the Hershey's kisses. I make these for various holidays changing the color of M&M's used. I also used Reese's Pieces this time as well. Play with the recipe to use Hershey's chocolate kisses or caramel, regular m&m's or peanut, and even other candies. Cover a baking sheet with foil or parchment. Lay O shaped pretzels down. Preheat the oven to about 300 degrees (doesn't have to be precise). Unwrap chocolates and place one kiss in the center of each pretzel. Place in a warm oven and heat for about 4-8 minutes (depending on how warm the oven is). All you are doing is heating the chocolate. The kisses hold their shape but will be shiny. Remove and press one m&m candy down into the center of the chocolate. If it's still too hard to squish, return to the oven for a couple more minutes and then press the candy down gently when they are ready. Eat. Warning - they go fast!! I served these last weekend when we had extended family visit and they were gone within 20 minutes! I can't say or type the words 'coconut cream pie' without thinking about Gilligan and Mary Ann and the island they were stuck on for years in the 1970's. But this post isn't about old television shows from my childhood... it's about a delicious and easy pie I plan to make this Thanksgiving! I am not, however, going to use the caramel on the top. I will serve it with the pie, but I prefer mine sans-caramel. My family however, will be drizzling. Sprinkle gelatin over 1/2 cup water, and let stand until softened, about 5 minutes. Spray a 10-inch round nonstick springform pan with nonstick cooking spray; set aside. Bring half-and-half to a boil in a large saucepan over medium-high heat. Add gelatin mixture and sugar and cook, stirring, until gelatin and sugar have dissolved. Remove from heat and let cool slightly. 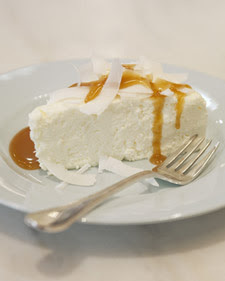 Stir in almond extract and grated coconut; stir in whipped cream. Transfer pudding to prepared springform pan and transfer to refrigerator until chilled and set, 2 to 3 hours. Unmold pudding onto a serving platter and sprinkle with shaved coconut. Serve with caramel sauce. Chewy Chocolate Chip Cookies - Surprise Someone Today! Shhh! Don't tell my family but I think I'm going to make them chocolate chip cookies tonight when I get home from work! Since I haven't made them today I'll have to borrow an image from the internet - but I hope it entices you to whip some cookies tonight after work as well! Now, I have an excellent and awesome cookie recipe that I'm known for. My cookies are soft and chewy and always mistaken for being bakery bought. However, when I saw this recipe it was very similar to my own and I instinctively knew it would be a 'keeper'. I'm making these tonight... and hope you will too! It's Veteran's Day today - maybe make a plate full for a military member (or retired member!) you know of in your neighborhood! Surprise them with a plate of freshly baked chocolate chip cookies. Enjoy. In a bowl, with an electric mixer on medium speed, beat butter and brown sugar until well blended. Beat in eggs and vanilla until smooth, scraping down sides of bowl as needed. In another bowl, mix flour, baking soda, and salt. Stir or beat into butter mixture until well incorporated. Stir in chocolate chips. Drop dough in walnut sized portions, 2 inches apart, onto buttered 12- by 15-inch baking sheets. Bake in a 400° oven until cookies are lightly browned, about 7-8 minutes. Let set on the baking sheet for about 2-3 minutes before transferring to a cookie rack to cool. Don't over bake or they won't be chewy! With the holidays coming up (Thanksgiving and Christmas, closely followed by New Years) I've been thumbing through my old 'holiday' recipe collection with my handwritten 3x5 note cards I've saved of my 'must make' over the years. Each year I try new recipes for a couple things, but when it's a winner, I save it in a special book. This recipe is one I copied into my files about 2 years ago. It's not 'my' lobster bisque recipe but it looked promising enough that at the time I made sure to add it to my collection to try. Admittedly, when I find one 'better' than I've been making in the past I always upgrade! I've not tried this one yet though... it has wine and brandy in it - which I don't use in my original lobster bisque recipe. I also have to cheat and use lobster meat that someone else has already cleaned, as I live about as far from the sea as you can... and if I was to purchase 2 whole, live lobsters, I'm afraid I would cry to have to spend that dearly to add it to a soup. I don't buy live lobsters where we live... although I might if we are ever lucky enough to live closer to the ocean. So - here is one from my collection - not tried and true. But it looked so good I knew I could improvise and give it a go! 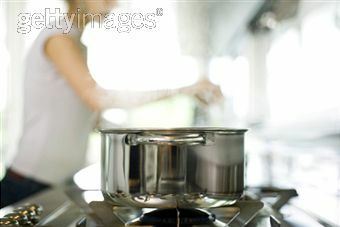 Combine 3 cups water, clam juice, and 1/2 cup wine in an 8-quart stockpot; bring to a boil. Add lobsters; cover and cook 10 minutes or until bright red. Remove lobsters from pan, reserving liquid in pan. Cool lobsters. Remove meat from tail and claws. Discard any roe or tomalley. Chop meat; chill until ready to use. Place lobster shells in pan. Add remaining 2 cups water, 1 cup carrot, 1 cup celery, 1 cup onion, 1/2 cup fennel, broth, tarragon, thyme, parsley, and bay leaves; bring to a boil. Reduce heat, and simmer, partially covered, 1 1/2 hours. Drain through a fine sieve over a bowl; discard solids. Melt butter in pan over medium heat; add remaining 1/2 cup carrot, remaining 1/2 cup celery, remaining 1/2 cup onion, remaining 1/2 cup fennel, and garlic; sauté 5 minutes. Add remaining 1/4 cup wine; cook 3 minutes or until liquid almost evaporates. Sprinkle flour over carrot mixture; cook 1 minute, stirring constantly. Stir in reserved cooking liquid and potato; cook 20 minutes or until potato is tender. Add tomatoes; cook 10 minutes. Place one-third of mixture in blender; process until smooth. Pour pureed mixture into a large bowl. Repeat procedure twice with remaining mixture. Return pureed mixture to pan. Stir in lobster, milk, cream, and brandy; cook 5 minutes over medium-low heat or until thoroughly heated (do not boil). Garnish if desired. This morning as I scanned through some of my recipes this one caught my eye - a Gouda and dark beer cheese dip/ball. Of course the timing is ironic with the Gouda cheese recall I just posted about - but guys, not all Gouda cheese on the market was recalled. Just the one company. So in honor of yummy Gouda Cheese (and my craving since reading this recipe this morning) I'm posting. YUM! With a sharp knife, cut the top to make a lid from the Gouda cheese ball, about 1 inch thick. Save the lid. Hollow out the cheese without cutting through the wall of the ball. The wall should be as thin as you can make it on all sides. Take the reserved Gouda cheese and grate it and set aside. In a small skillet, heat 2 tbsp butter over medium heat. Add the onion and saute until it reaches a golden brown color. This usually takes about 7 to 10 minutes. Stir often. Remove the onion from the skillet and set aside to cool. Combine the Gouda, Roquefort, and Cheddar cheeses in a food processor, along with the remaining butter, the onions and the Worcestershire, mustard, and hot pepper sauce. Process the mixture until smooth. Scrape the sides occasionally. Pour in the beer and continue to process until smooth and creamy. Next, fill the hollowed out Gouda ball with the mixture. Place the lid on the ball of cheese and put the remaining dip into a bowl. Cover both with plastic wrap and refrigerate before serving. I'm a Costco Shopper... relocated from the West Coast and Love Gouda Cheese... Recall Notice! Free samples and packages of Gouda cheese sold at Costco have been removed from store shelves after being linked to 25 cases of an E. coli outbreak in five Western states, according to health officials. Costco, the Food and Drug Administration and the Centers for Disease Control and Prevention warn consumers not to eat Bravo Farms Dutch Style Gouda that was sold in Arizona, California, Colorado, New Mexico and Nevada, an FDA news release says. As of Thursday, 25 people, including nine who were hospitalized, had been sickened by E. coli 0157:H7, which causes diarrhea and abdominal cramps. While most people recover in a week, some may develop more severe symptoms of infection or, rarely, a type of kidney failure. One of the cases may be the form of kidney failure called hemolytic uremic syndrome, the FDA's release says. The FDA instructs anyone who has the cheese to return it to the store or dispose of it in a sealed bag that keeps anyone else from getting access. The FDA and the state of California have begun an investigation of Bravo Farms in Travor, Calif. Caught in mid-boil with a flash. Flash ruins photos so it's not as yummy looking as it really was! Not a soup, but a nice thick bowl of homemade noodles in a thick chicken broth. If it were more liquid with a bit of parsley it could be a soup but what I wanted was a nice big bowl of warm, comforting old fashioned chicken and noodles. This original recipe is from the turn of the century... 1900, not 2000. It is one all of our great-great grandmothers made I'm sure and no none actually used a 'recipe' for. I took a lot of liberties with it. I was craving this recipe myself because it is getting cold out and my body loves homemade noodles when it's Autumn. However, I also made it because my 14 year old daughter has a terrible cold this week and I knew homemade chicken and noodles would help. Lastly, I always (always!) believe in making 2 meals out of one if at all possible and I had a half chicken to use up! Frugality should be a way of life and you should never throw out leftover food, but instead, find another way to use it in a fresh, new way. Changes to the 'old' recipe I made: Earlier this week we had a roasted chicken for dinner; we only ate a little over 1/2 of it so instead of fresh chickens I used the whole chicken carcass I still had with a whole side breast still on it. Another difference is using modern convenience; I use a food processor with an 'S' blade to mix my noodle dough and then use a hand crank pasta machine to roll the dough instead of rolling it out and flattening it 8 times with a rolling pin. I also use what I have on hand to make the broth and hope you will to. No carrots? No problem. I didn't use any either. I also didn't have celery this time around. This meal was so warm, hearty and filling not only did my family rave about it, but I can't wait to take some to work with me to day for lunch; my mouth is watering at the thought! Play with this 'recipe' and use what you have on hand and what you like! Simmer the chicken with celery, onions, carrots and garlic in a pan on the stove. Skim off the scum. Don't let it boil - keep it at a simmer. Remove the chicken, strain the broth through a sieve, discarding the vegetables and returning the broth to the pan. Remove and pull the meat off the bones and add to the broth. Thicken it by mixing 2 T flour and about 1/3 - 1/2 c water together and whisking it into the broth. Bring to a brief boil, reduce heat and season with the salt and pepper. Mix the eggs with flour, oil, salt and pepper in a food processor. Process with an 'S' blade, adding just a touch of oil or a teaspoon of water if it's too dry. As soon as the dough comes together to a ball stop and remove it. Let it rest for a few minutes. You can use a hand crank pasta machine if you have one to thin and roll the dough and cut into noodles. If you don't have one, roll and stretch the dough about 8 times until very thin. 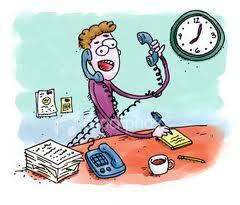 Hang over a line or waxed paper or foil and dry for 30 minutes. Don't let it become brittle. Roll it and cut it into thin noodles. Cook them in boiling water 10 minutes then drain and add to the chicken sauce. Serve. 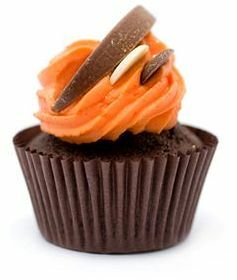 Halloween and Thanksgiving - both use orange and brown in their decorating so when I saw this photo of a yummy scrumptious little brownie cupcake in a chocolate cup I knew it would be perfect for October or November! Of course with a dessert like this you have to take one of two paths... you take a little more time to make it all from scratch, including the chocolate cups or you cheat a little and buy premade chocolate cups and improvise a little to same time. If you want to make the cups from scratch they really aren't hard to do at all - and only take about 30 minutes from start to finish. Make them similar to how I showed you I make my chocolate leaves. The difference is that you use 2 cupcake liners (to make it more sturdy) and you 'paint' the inside of the cup with a thin layer of melted chocolate. Refrigerate for about 5 minutes to set your chocolate up and then paint another thin later - refrigerate - and repeat. You'll want about 4-5 thin layers to make a nice thick cup - which will make it easier to remove the paper liner later on. Thin cups break easily. I would only caution you to make at least 2 'extra' cups to allow for breakage. After your final 'chill' you remove the 2nd liner and then carefully start to tear away the cupcake liner from the chocolate from the top down. Continue and then finally, pull it away from the bottom. Try not to touch the chocolate as it will melt quickly if your hands are warm and you will leave fingerprints. You can make chocolate cups ahead of time and keep them in the refrigerator until you are ready to make the rest of the dessert as well. If you are like me you may be able to carve out 30 minutes here and another 40 minutes there, but never 3 hours all at once! And if you don't want to make cups from scratch you don't have to! You can buy them! I did a quick search and found Dark Chocolate Dessert Cups, Milk Chocolate Dessert Cups and for the extra fancy desserts? Try Belgian Large Chocolate Cups. Now you can either make the cupcake or brownie from scratch or use a store bought mix. Make according to directions. When cool, refrigerate them so they are completely cold or they will melt your chocolate! To fit them into the cupake liners you'll need to 'trim' them with a knife so remove the paper from your cupcakes or brownies and trim the bottoms and sides to make them just a hair smaller so they will drop into your chocolate liners without breaking the cups. Don't trim the tops if you can help it as this makes them stay 'pretty' on top. But if you have really thick chocolate cups and you do have to trim the tops as well it won't matter because you can cover it up with the frosting or whipped cream! Take your 'naked' brownie or cupcake and get busy with the frosting! This is the FUN part! Using frosting you've tinted orange or a nice thick whipped cream you've tinted, add the toppings to your dessert with a decorating bag and frosting tip to form the swirl. Finish off your creation with holiday sprinkles, jimmies, chocolate curls or mini chocolate chips. I'm a big fan of Old Bay Seasoning... I even partnered with them last summer to bring you (my readers) a contest in which one of you won a large beach bag filled with Old Bay goodies like a beach towel, lots of Old Bay Seasoning, beverage opener and other items needed to host a great Old Bay Beach party or backyard BBQ. I'm always on the lookout for more recipes to use some of my (3) cans of various flavors of Old Bay Seasoning. When I saw this one for shrimp burgers I immediately was drawn to it because of my love for seafood but also for the spiced mayo it offered as well. What SIMPLE and yummy mayo idea! Last night we had salmon burgers for dinner and this mayo was the perfect condiment to serve with them! I also served plain mayo next to it as a choice but the flavor of this Old Bay Mayo added just the right touch to the salmon. I haven't made these shrimp burgers yet but jot this recipe down if only for the mayo to serve with your salmon! Coarsely chop half of the shrimp. Put the remaining shrimp in a food processor and pulse until smooth. Combine both shrimp in a large bowl with egg, bread crumbs, scallions, lemon juice, salt, pepper, and garlic powder, and mix. Refrigerate 10 minutes, and then form into four patties. Heat canola oil in a large skillet over medium high heat. Cook burgers about 3 minutes per side. For the mayo, combine mayonnaise and old bay seasoning. Spread bun with mayo and top burger with tomato, avocado, and lettuce. It's cold and rainy today and Fall is on her way out to make room for winter. Brrr! It's the time of year when my body starts to crave more filling foods, but I cannot get away from my bodies love of seafood! I dug this recipe out of my files and couldn't wait to get it posted as I usually prop my laptop up on the kitchen counter and bring up the days recipe and proceed to make it in my kitchen from my own website (thus, how this site was started back in 2006! A place to store my collected recipes!). Heat oven to 350 degrees. Grease 9x13x2 baking dish. Stir cream cheese, scallions, milk & Old Bay seasoning in large bowl until smooth. Stir in peppers, reserving about a half cup. Add broccoli, reserving a half cup. Add crabmeat, 1 egg, salt & pepper. Whisk remaining egg into alfredo sauce. Spread about 1/3 cup alfredo sauce into prepared baking dish. Top with 3 noodles & 1/3 crab mixture. Repeat, layering twice with noodles, crabmeat, noodles, crabmeat, noodles, crabmeat. Top with 3 noodles; sprinkle with reserved red pepper & broccoli. Pour on remaining alfredo sauce. Sprinkle with parmesan. Bake, covered, in 350 oven 30 minutes. Uncover & bake 20-25 minutes, until browned & bubbly. Let stand 10 minutes before cutting. About 12 servings. A Milwaukee sausage company is issuing a national recall of beef sticks because they may contain foreign material. The U.S. Department of Agriculture's Food Safety and Inspection Service says Klement Sausage Co. Inc. is recalling nearly 2,800 pounds of beef stick products. They are the 8-ounce packages of "Market Pantry Beef Sticks, Original" and have a "use by" date of March 1, 2012. The USDA reports that the problem was discovered after a retail chain reported consumer complaints about finding hard plastic and pieces of glass in the meat. It has so far not received any reports of injury. If I'm not mistaken, the Market Pantry brand is a Target store brand so heads up! If any of you bought this product be sure to return it. My bigger concern? Sooo many of these have been bought recently to send in packages to our troops overseas! If you know someone who may have bought them to package in mailings for our troops serving in Iraq and Afghanistan, make sure they know to pull the beef sticks out and check the brand and use by date!!! About 10 years ago I discovered Splenda sweetener and it's been a staple in our home ever since. None of us are Diabetic or use it for medical reasons so we have regular white and brown sugar in our household as well but I love cooking and baking sugar-free or lower sugar when I can so Brown Sugar Twin and Splenda as well as a handful of other sweeteners are on hand too. Another plus to this recipe I found thru Splenda is the use of whole wheat flour. I think Autumn recipes and whole wheat flour go hand in hand! There is some natural sugar in this recipe from the apple juice and apple slices, but there is no white sugar in it. Preheat oven to 350 degrees F. Spray a 9x9-inch baking pan with vegetable cooking spray. Set aside. Combine flours, baking powder, soda, salt, and spices in a large mixing bowl. Set aside. Combine egg, canola oil, milk, juice, vanilla, and SPLENDA® Granulated Sweetener in a small mixing bowl. Add liquid mixture to dry ingredients, stirring just until moistened. Stir in apples and walnuts. Spoon mixture into prepared pan. Combine flour, SPLENDA® Granulated Sweetener, cinnamon, and baking powder. Add oil stirring until blended. Stir in walnuts. Sprinkle topping over the batter. Bake for 25 minutes or until a wooden pick inserted in center comes out clean.